A stellar cast of acclaimed fantasy writers weave spellbinding tales that bring the world of witches to life. Boasting over 70 awards between them, including a Newbery Medal, five Hugo Awards and a Carnegie Medal, the authors delve into the realms of magic to explore all things witchy...From familiars that talk, to covens that offer dark secrets to explore, these are tales to tickle the hair on the back of your neck and send shivers down your spine. 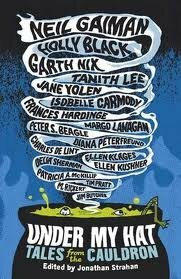 Be truly spooked by these stunning stories by Diana Peterfreund, Frances Hardinge, Garth Nix, Holly Black, Charles de Lint, Tanith Lee, Neil Gaiman, Ellen Klages, Ellen Kushner, Delia Sherman, Patricia A. McKillip, Tim Pratt, M. Rickert, Isobelle Carmody, Jane Yolen, Jim Butcher, Peter S. Beagle and Margo Lanagan.